Welcome to my website. I am Josanna Thompson and I am excited to announce the release of my first book, A Maiden's Honor. It is the first book of The Woman from Eden series. Are you curious about A Maiden's Honor? Continue reading.. I had a blast designing my website. I added LOTS of extras, including character interviews, and articles about my research. You can also read the first chapter. One of my favorite features is where readers can ask the characters from A Maiden's Honor questions. (And they will answer you! How cool is that?) These features are all listed under the Extras section. Check in with my website from time to time. I will be adding new articles on a regular basis. (New articles are listed below.) Please feel free to sign up for my newsletter. You will be the first to receive news about the next two installments of The Woman from Eden series. Finally, join me on Facebook, Twitter, and Instagram. - New look for my website. A young woman raised in the South Pacific, captured by pirates. The Dey of Algiers, torn by conflicts in religion and love. Their stories intertwine. Raised by her Scottish father and the natives of a remote island in the South Pacific, Sarah Campbell and her father embark on a perilous journey to Scotland. Sarah knew that her life would change when she left her beloved island. Never did she imagine that she would be sold into a harem. 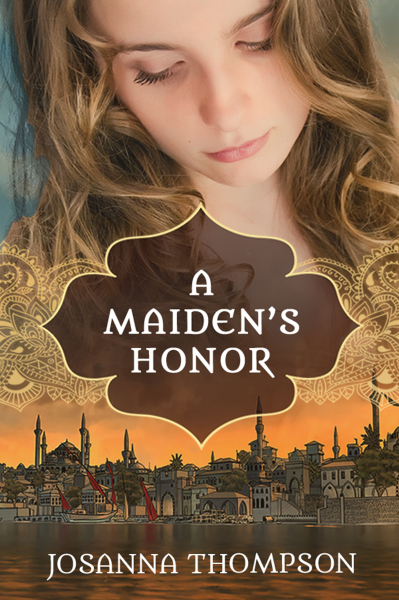 Only Hassan Aziz, the most feared pirate on the Barbary Coast can save her. But is Hassan willing to jeopardize his secret mission and risk his life and the lives of his crew to shield this intoxicating maiden from slavery? Naa’il is the Dey of Algiers, a man who has everything including, wealth, power, wives, slaves, concubines. Two American cousins are presented to him, Naa’il is told that only one is a virgin. Drawn to these beautiful maidens, Naa’il tests their loyalty to each other. Little did he know that his game would have devastating consequences… especially for him. "The Woman from Eden series chronicles Sarah Campbell's journey to the West. She really gets around too. Not only does she visit Barbary Coast and the Ottoman Empire, Sarah also journeys to England, the United States, and the Caribbean islands. Each place offers offers Sarah a new set of obsticles to overcome.